Many parents will ask at their child’s exam, “When is the best time to start orthodontic treatment?” The answer is that it varies from person to person, depending on what the orthodontic problems are. 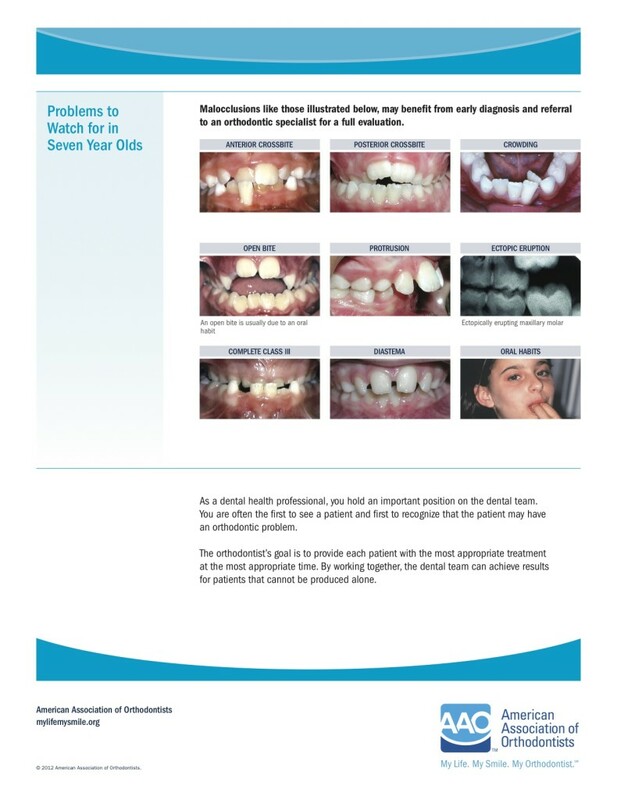 The American Association of Orthodontists recommends that kids be seen for their first orthodontic check up at age 7. This is the age when most kids have their permanent front teeth, incisors, and their first set of adult molars fully grown into place. In most cases, kids don’t need treatment at that age, but Dr Kyger can identify any potential problems that are developing and give you an idea of when the appropriate time to start will be. In general, it is easier on everyone (the patient, orthodontist, and the parents) if treatment starts after all the adult teeth have grown in (usually around the age of 12-13). However, their are some instances where it is advisable to start treatment earlier than that. Sometimes Dr Kyger will recommend treatment while some of the baby teeth are still present. This is often called interceptive, or Phase One, orthodontic treatment. Some of the indications for this early treatment are significant crowding or bite problems (overbites, underbites, open bites, extreme deep bites where the lower front teeth are digging into the roof of the mouth, and crossbites of the front or back teeth). Some of these bite problems are associated with a current thumb or finger sucking habit that needs to be addressed as well. One of the goals of Phase One treatment are to harmonize the growth of the upper and lower jaws as much as possible. Another goal is to make enough room through expansion of the dental arches to make enough room for all the adult teeth to fit into place. Our goal is to treat our patients without having to have any teeth pulled whenever possible. By timing an appropriate Phase One treatment we are usually able to straighten all the teeth in Phase Two without any extractions. You can think of Phase One as treating significant bite problems or correcting a developing skeletal growth problem. Phase Two is the definitive straightening of the teeth. Most people are ready for Phase Two by the time they are 12 to 13 years old. This is usually the age when most people have lost all their baby teeth and the adult second molars all the way in the back have grown into place. Phase Two is usually a shorter treatment time than it would have been without the Phase One treatment (12-18 months vs 18-24 months). On rare occasions we get such a nice result out of Phase One that we don’t need to do a Phase Two treatment. This is the exception to the rule, however. If your child is getting Phase One treatment, plan on needing a Phase Two treatment in a few years. This entry was posted in Patient Education and tagged interceptive orthodontics, orthodontics, phase 1, phase 2, phase one, phase two by DrDelKyger. Bookmark the permalink. Very Good article! I really have no clue on what is the proper time or age to visit the dentist. This article provide the concise explanation about the phases of treatment. I’m glad to bring my son her and have his initial orthodontic treatment since he is already 8 years old.